Search Results for "kuang si"
Cascade of beautiful Kuang Si waterfall (sometimes spelled Kuang Xi) or known as Tat Kuang Si Falls, South of Luang Prabang, Laos with Yellow leaves spring filter. Facade of Kuang Si waterfall (sometimes spelled Kuang Xi) or known as Tat Kuang Si Falls, South of Luang Prabang, Laos. The Kuang Si Falls, known as Tat Kuang Si Waterfalls Luangprabang, Laos. LUANG PRABANG, LAOS - CIRCA AUGUST 10 - Tourists enjoy with the Tat Kuang Si waterfall circa AUGUST 10, 2014.Tat Kuang Si is the largest waterfall in Luang Prabang. 00:00 | 00:00 1× LUANG PRABANG, LAOS - CIRCA AUGUST 10 - Tourists enjoy with the Tat Kuang Si waterfall circa AUGUST 10, 2014.Tat Kuang Si is the largest waterfall in Luang Prabang. The Kuang Si Falls, known as Tat Kuang Si Waterfalls Luang Prabang, Laos. Water cascade in tropical jungle. The Kuang Si Falls, known as Tat Kuang Si Waterfalls Luangprabang, Laos. a garbage floats on the lake. The Kuang Si Falls, known as Tat Kuang Si Waterfalls Luangprabang, Laos. View of beautiful Tat Kuang Si Waterfalls in Luang Prabang, Laos. 4k shot of the beautiful turquoise cascade pools at the foot of the main waterfall of the famous Kuang Si falls in Laos, Southeast Asia. 4k pan out of the main waterfall at the famous Kuang Si falls in Laos, Southeast Asia. 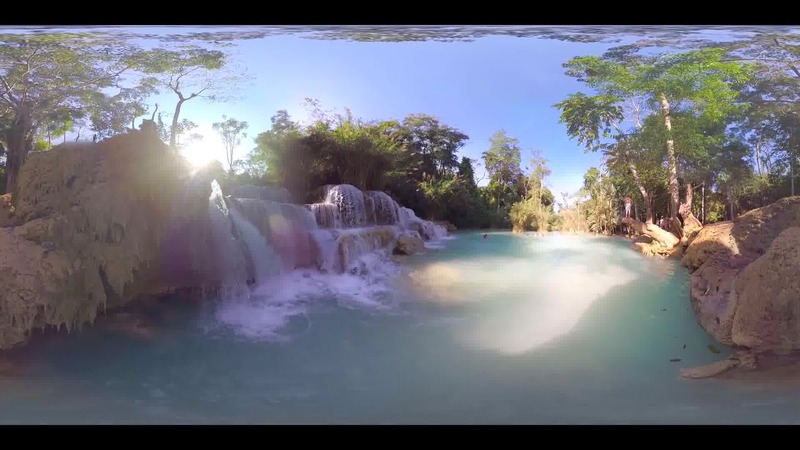 4k footage of the main waterfall at the famous Kuang Si falls in Laos, Southeast Asia. 4k pan of the beautiful turquoise cascade pools at the famous Kuang Si waterfalls in Laos, Southeast Asia. 4k pan going through the lush jungle vegetation and uncovering a sight at one of the numerous cascades of the famous Kuang Si waterfalls in Laos, Southeast Asia. 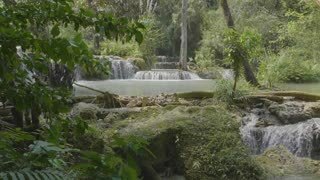 4k footage of the heavenly base of the famous multi-level Kuang Si waterfall. 4k Video shot aerial view by drone. Kuang Si Waterfall Famous Landmark Nature Travel Place Of Luang Prabang City, Laos. Bird eye view landscape.